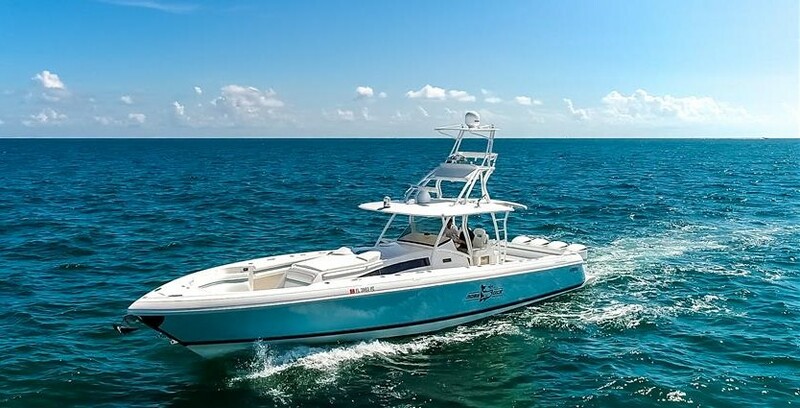 The Intrepid 400 Cuddy is a high quality performance cruiser with the advanced design and engineering attributes common to the Intrepid brand. She is built on a cored and vacuum bagged hull that features a single step deep vee design with a fine entry and slender 11'1" beam. She is a semi-custom boat ensuring no two are identical. "VINO" features Triple 300 HP Yamahas with Only 320 Hours and Extended Warranties, a Diesel Gen-set, A/C, Garmin Electronics, a Fusion Stereo System and JL Audio Speakers. She has been Lift Kept Since New and Shows as New.